Learning to sail as a family is a great way to spend quality time together while discovering a sport for life. 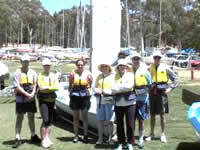 The focus of the course is to have fun, keep safe and learn to sail. It is an excellent way to keep active and enjoy valuable family time. Family courses are available from ages 13 – 70. The maximum per boat is 4 persons. The adult sailing course is programmed to fit in with your busy lifestyle. The courses are designed for beginners through to the experienced sailor wishing to improve and build on existing skills. ¨ Adult & Family Sailing courses are conducted during the months of October to April. Each course consists of 14 hours of theory and practical coaching. ¨ These courses are designed for adults who have completed a Level 1 course and are looking to build skills on that foundation. Each course is held on a Tuesday & Wednesday evening for four weeks. Please find more information by downloading the brochure below. ¨ Private one-on-one tuition is available. Times, types and duration of sessions can be negotiated with the office at any time. Sailing Course Prices (per person including GST). Our sailing courses are extremely popular, to secure you a place and avoid disappointment, we require FULL payment at the time of booking. Shoes Two pairs, one enclosed (no sandals or thongs) for the water, aqua booties or reef walkers are great and one dry pair for on land. Pants Shorts or track pants are fine over swimmers. Hat We recommend to wear a hat at all times outside, base ball caps are the best. Sunscreen is provided. Food Bring if you wish, the club has a fish and chip shop and soft drink machines. Water Water bottles are strongly encouraged and can be carried on the boats. We find that it is good to bring two sets of clothes as there is definitely a reluctance to get back into wet clothing after lunch! Find us here on the Map! Courses will be listed here as they become available. Click the Register link to reserve your spot.